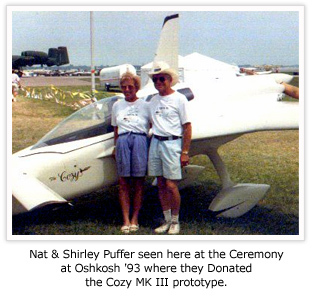 Nat & Shirley Puffer seen here at the Ceremony at Oshkosh '93 where they Donated the Cozy MK III prototype. The info pack contains 2 frameable pictures, sample pages from our construction manual, a summary of composite construction, specifications and a 3-view drawing, a complete flight test report, a number of magazine reprints, history of the design and of our company, a current newsletter, and other things of interest. Cozy Mark IV Info Packs are available only from Aircraft Spruce. To order: call 1-877-477-7823, fax 951-372-0555, or email info@aircraftspruce.com. Please include your full name and address when ordering.